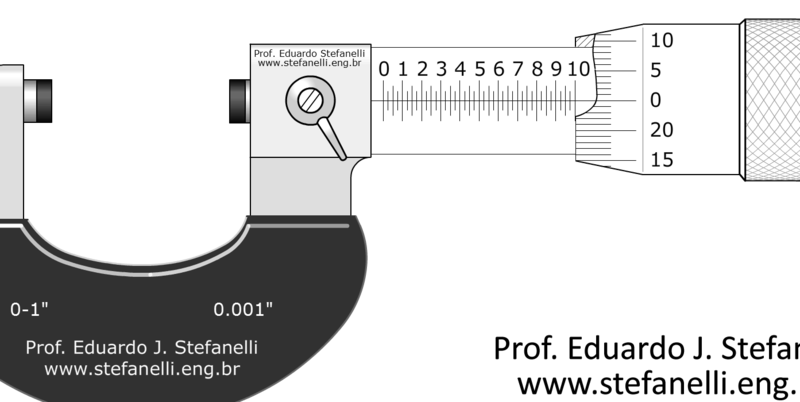 This page assumes that you have already interacted with the page: micrometer in millimeter hundredth resolution – use, reading and interpretation and with the page: reading of ruler or line gauge, in tenth inch. A complete turn in the thimble (and of the fuse) produces the advance equal to the thread pitch. The screw of this fuse, usually, has the lenght of the one inch and the pass of 25 thousandths of inch. In the sleeve there is a graduation that controls the advance of the thimble/fuse – figure 1. The inch (10 tenths) is divided by nine main marks, the distance between them is the tenth of inch, these marks have numbers to help the reading. The tenths of inch are divided by three marks that control the advance of twenty and five thousandth of inch (0.1/4 in = 0.025 in). This means that each time that a new mark is revealed by the thimble, the fuse moved close to twenty and five thousandth of inch(0.025in). 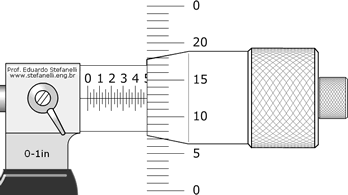 The configuration most commonly found in the metal / mechanical workshops is the micrometer spindle having a pitch of 0.025 in and the barrel 25 divisions-Figure 2. Thus, by turning the micrometer spindle each marking of the barrel passing through the ‘Reference line’ will indicate that The movable stopper moved away (or approached) 0.001 in (one thousandth of an inch).